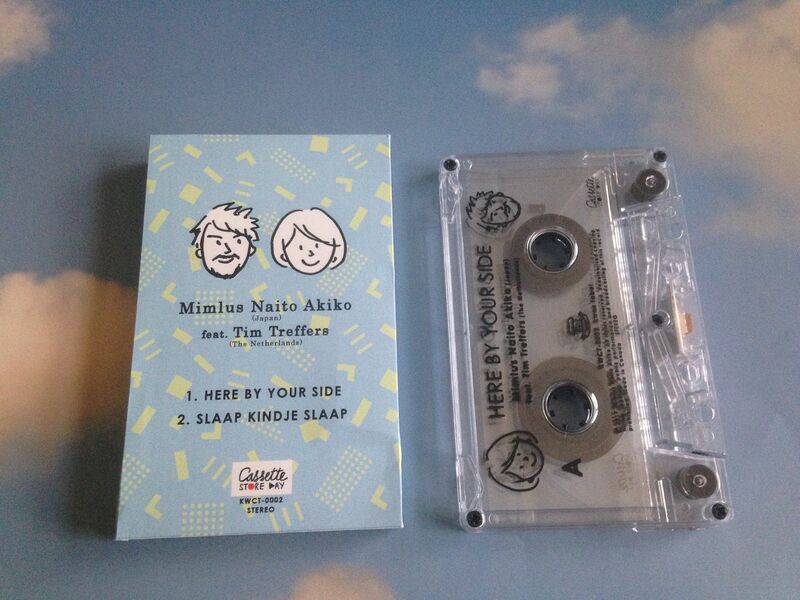 Raised by Gypsies ::: Cassette Review: Mimlus Naito Akiko feat. 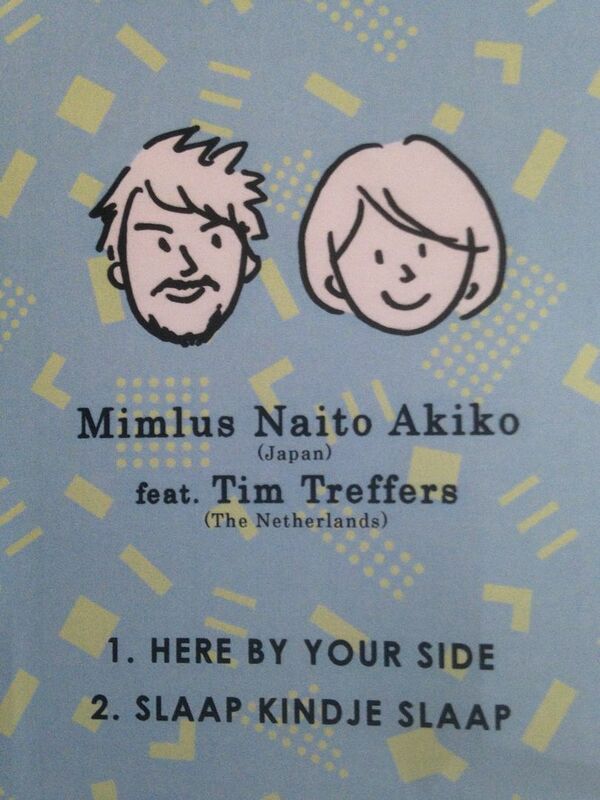 Tim Treffers "HERE BY YOUR SIDE"
Cassette Review: Mimlus Naito Akiko feat. 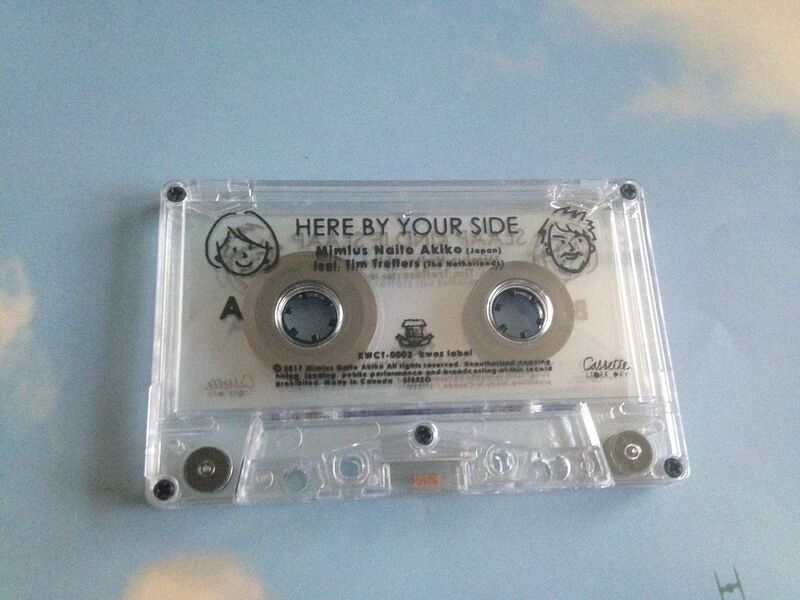 Tim Treffers "HERE BY YOUR SIDE"
One thing I always and forever love about cassettes is the way they represent art outside of the music. 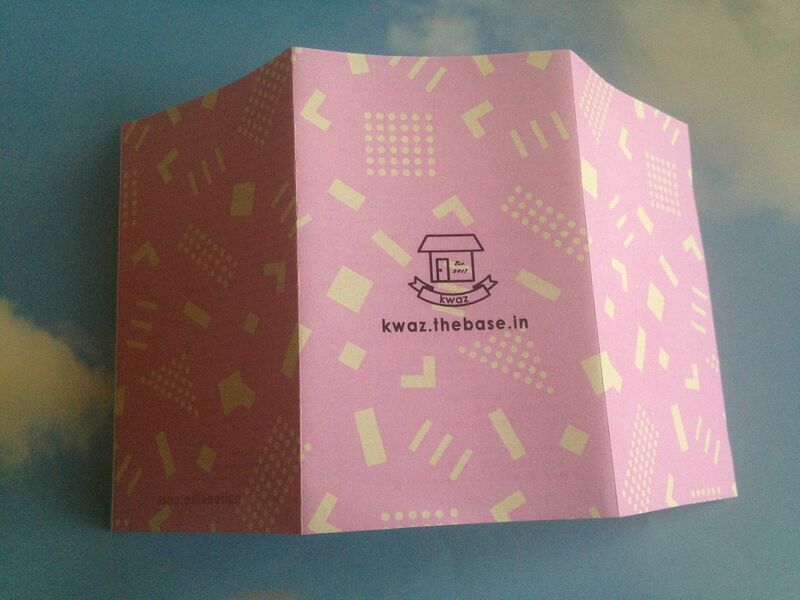 Yes, some people choose to take a photo for their cover art, print it and fold it into a j-card giving little thought to the actual cassette itself, but other times people can get really creative and bring out the best in the medium. 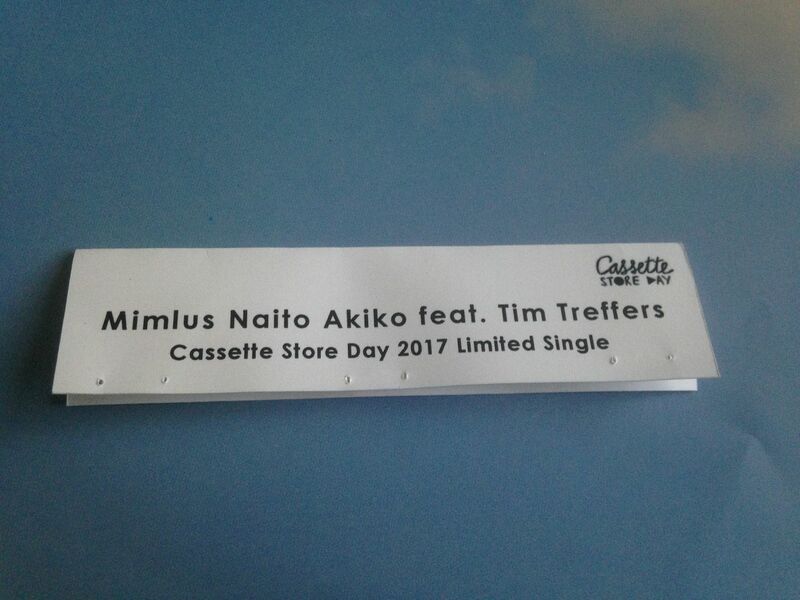 Mimlus Naito Akiko has this Cassette Store Day cassingle release from 2017 which features Tim Treffers and it comes inside a plastic bag. This is something I would tear open under any other circumstances, but instead, I carefully undo each of the three staples to maintain the perfection of it all. 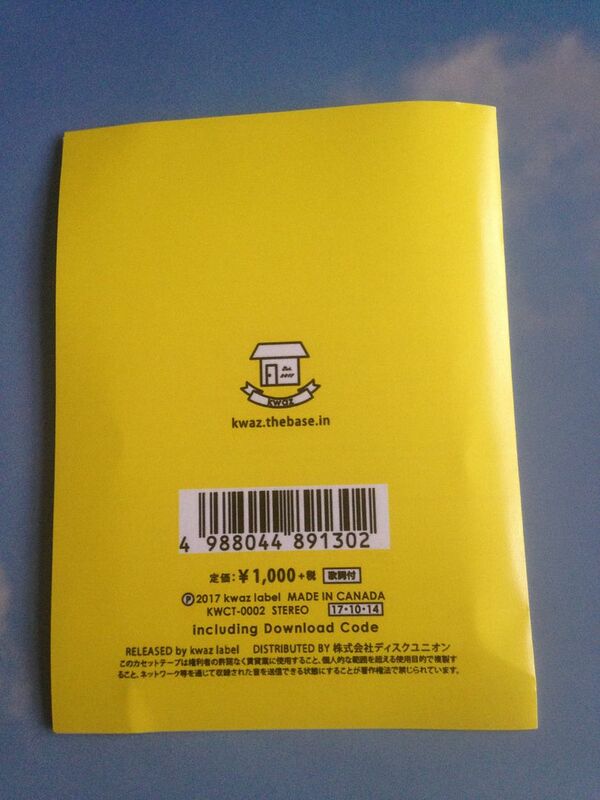 Not only does this cassette come in the wrap around card it has a solid yellow backing which not only has artwork on it but unfolds to reveal a little bit about each of these two artists. 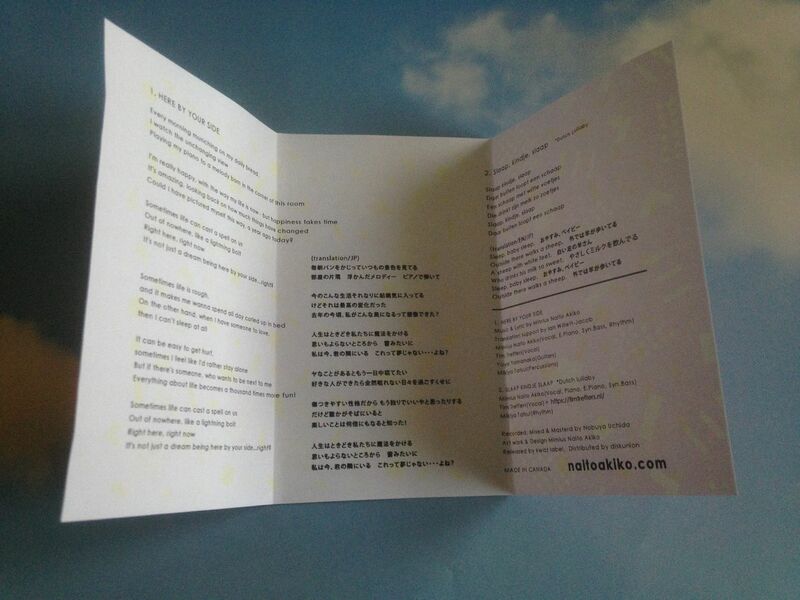 There is also a small paper inside with lyrics and linear notes on it. In a sense, this has a certain simplicity to it but that isn't to call it simple. It just seems like something that could make things like artwork so much easier outside of a typical plastic shell and yet this is the first time I can really recall seeing something of this sort done. 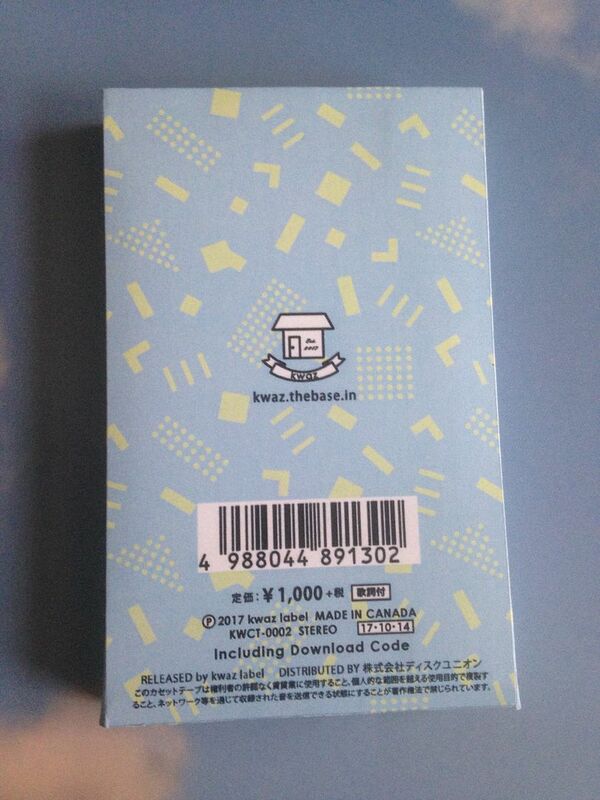 I really want there to be an entire cassette label who releases all of their cassettes in a similar design. 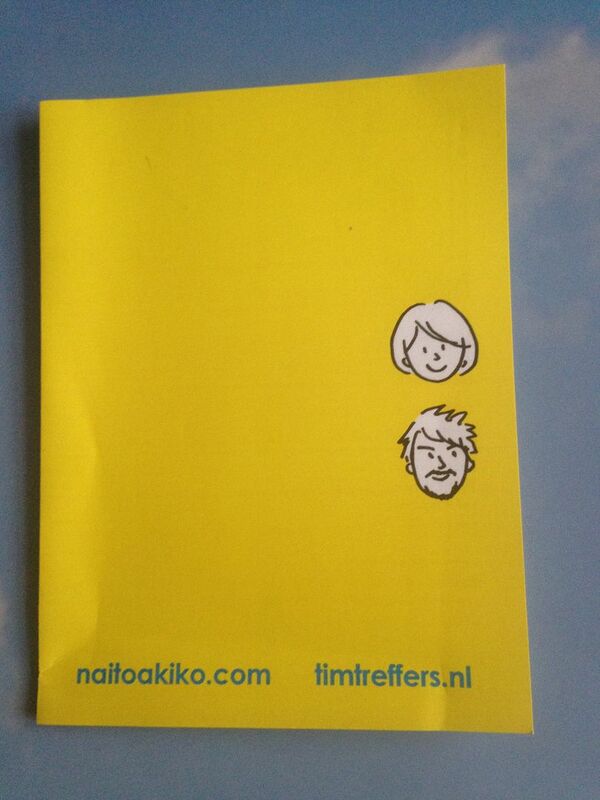 This is two songs and the keyword here that I failed to notice before pressing play is that this is Mimlus Naito Akiko *featuring* Tim Treffers. For some reason I was under the impression that this was going to be a split and each of them would have a song on each side. 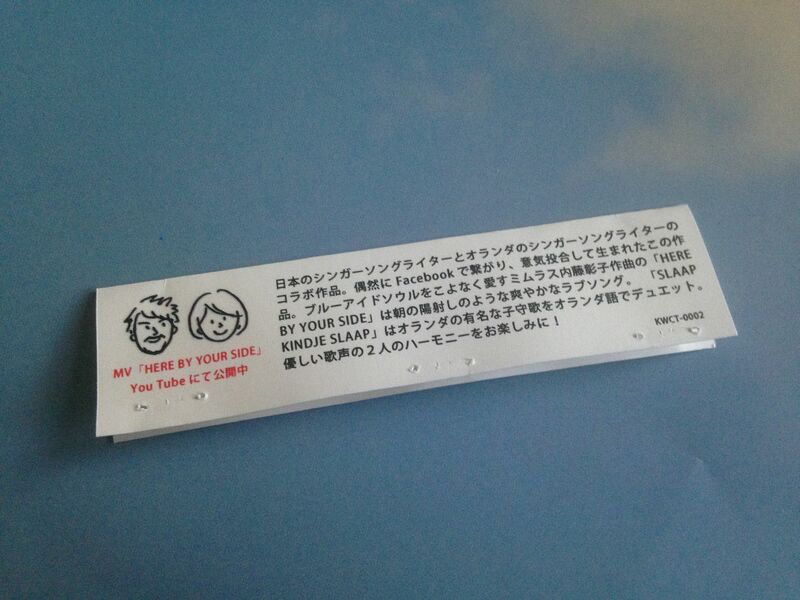 "Here By Your SIde" is this slower, sweet ballad of sorts with hints of the 1980's and 1990's. 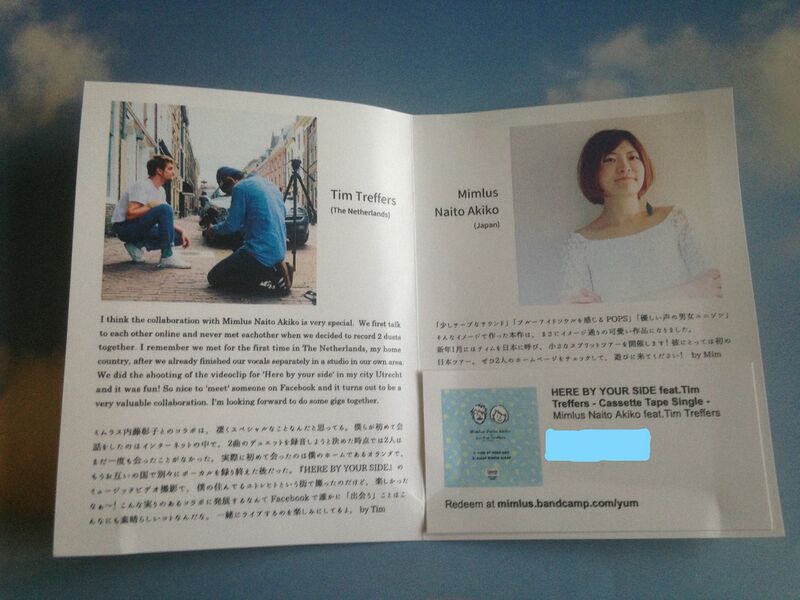 Both Mimlus Naito Akiko and Tim Treffers sing during the song- sometimes they take turns and sometimes they sing together. Overall though the song really makes me think of a modern version of "I Got You Babe" by Sonny and Cher, if only because this song seems so happy. 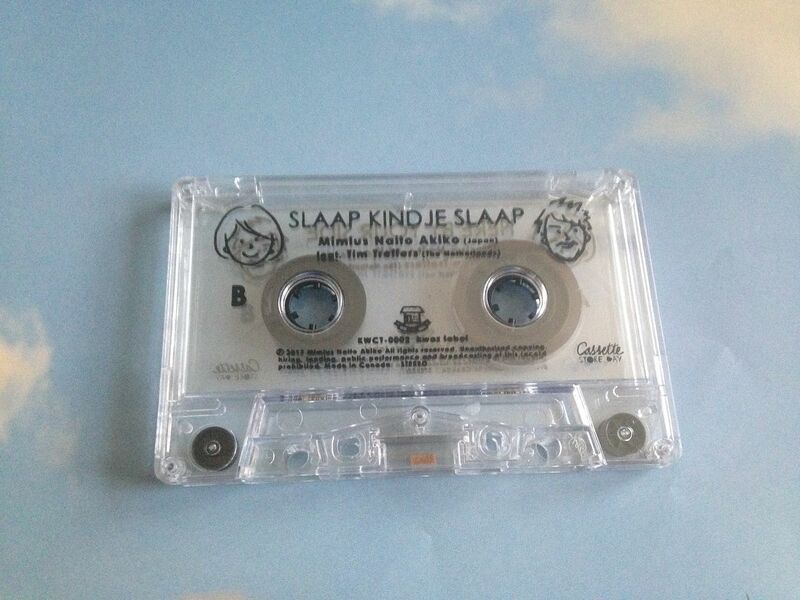 "Saap Kindje Slaap" is actually a Dutch lullaby (thanks linear notes!) and it feels like one. I would definitely recommend playing this to try and get a baby to sleep or maybe even yourself. And that is kind of the theme of this cassette. Not sleep, but that relaxing feeling of being happy, satisfied. In many ways that is what the music of Mimlus Naito Akiko does overall but it isn't about the fact that it conveys those emotions it is more important how it does it. If there was a song which was overally happy (like that song called "Happy") and you imagined it being played over and over I'm sure that would not be the type of album anyone would want to hear because it'd be like eating too much candy. Mimlus Naito Akiko knows just how to deliver the proper balance to maintain true happiness through her music.